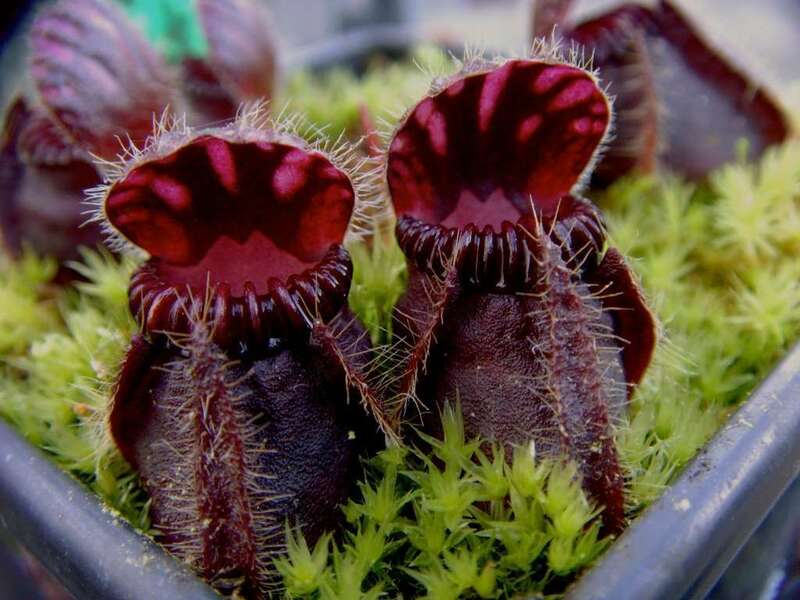 The Australian Pitcher Plant (Cephalotus follicularis) is the small cousin of the pitcher plant family. Like the Cobra Lily, it is the only species within its genus, but it does have several cultivars that exhibit variations in trap size and coloration. 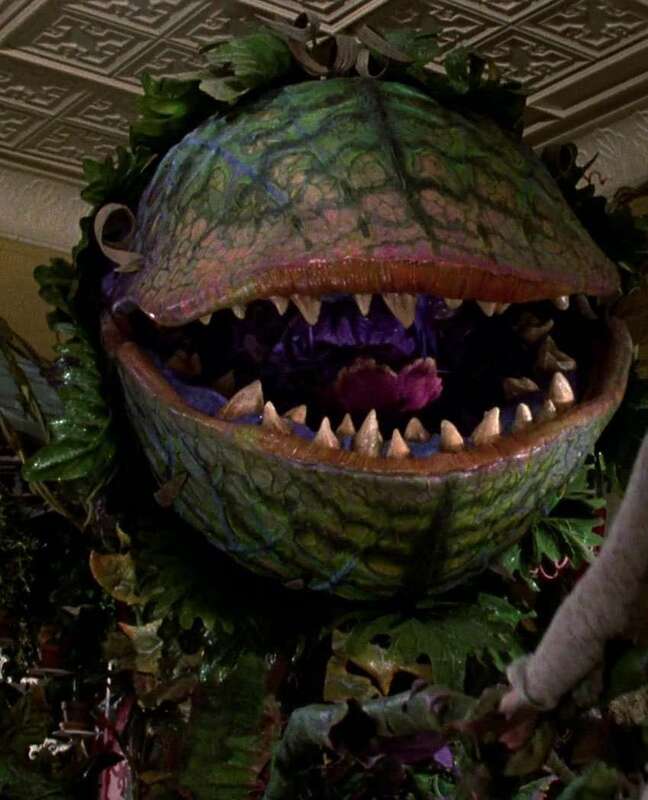 The plant’s physical appearance is that of a miniaturized, fuzzy, wrinkly Nepenthes with bright reds, greens, whites, and purples. 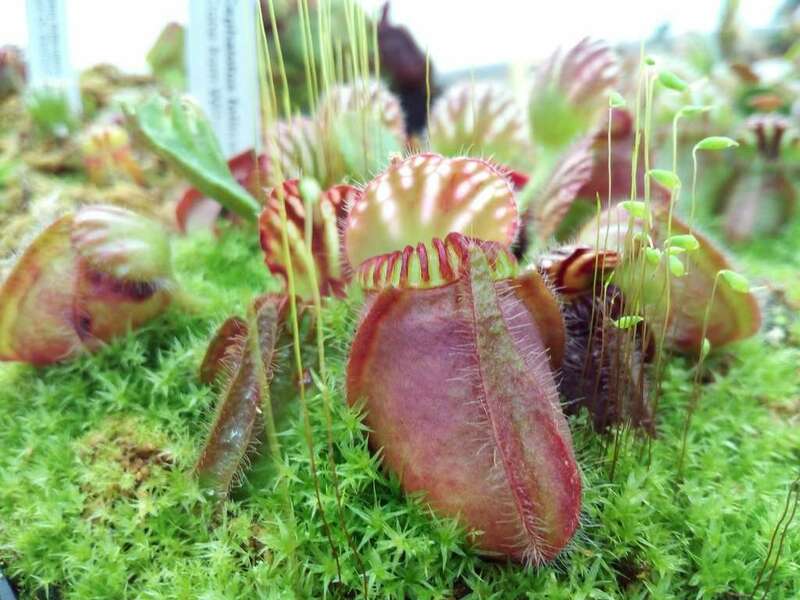 – A very fascinating appearance, making it very desirable among carnivorous plant collectors. The short pitcher-traps grow in dense rosetted clusters that hang low to the ground. 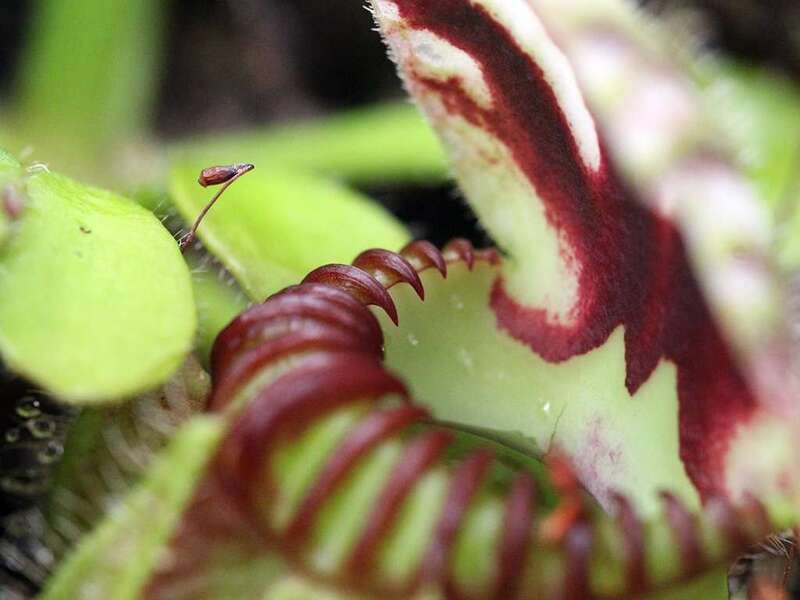 Jagged sharp ridges line the lip (peristome) of the trap; they both prevent insects from escaping the trap and give the pitchers a violent appearance. 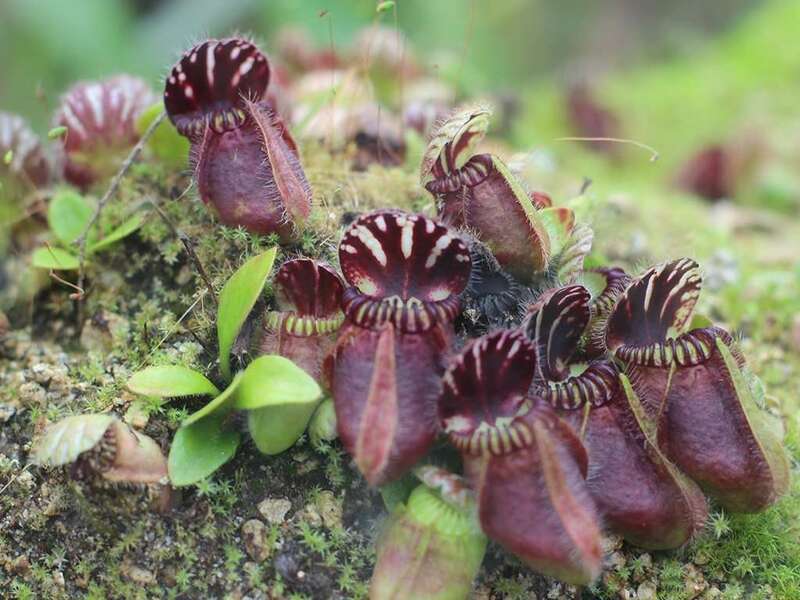 The traps on the plant collect and digest bugs in the traditional manner of pitcher plants. The bulb of the pitcher contains digestive enzymes, which dissolve bugs and prepare the nutrients for absorption. The pitchers of an Australian pitcher plant are fuzzy little traps that grow at the end of petioles. These petioles extend, in a rosette pattern, from the center of the plant. Pitchers generally grow to a maximum size of about 1 1/2 inches, but a “Giant” variety can produce 3 inch traps. A lid overhangs the trap, protecting it from rain and shading the digestive juices from evaporation. Inside the trap, there is a slippery collar that secrets nectar to encourage insects to spelunk into the pitcher. Dunking a head into the trap to feast upon the nectar, an insect will lose its grip and fall to the digest juices below. The insect will have a difficult time scaling the waxy interior of the trap, but even if they do, they will not be able to navigate the overhanging collar. 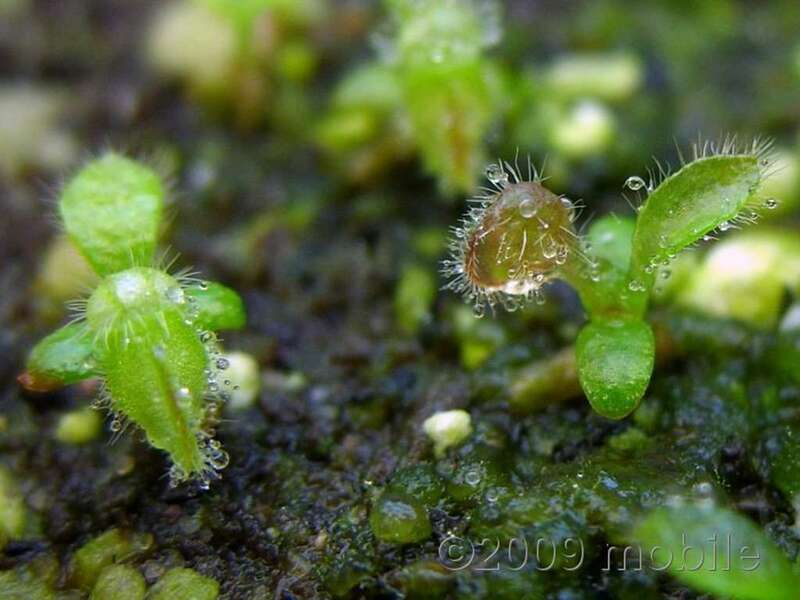 In addition to carnivorous leaves, Cephalotus follicularis produce bright green, oval, pointed, non-carnivorous leaves to aid in photosynthesis. Hailing from the southwestern coastal tip of Australia, the Cephalotus follicularis requires a Mediterranean-like climate of warm, dry summer, and cool wet winters. Extreme or extended heat will kill the plant, but it will tolerate brief frosts down to the mid-twenties. Growth will slow or stall in the winter, but they are evergreen perennials with old leaves dying as new ones replace them. The Australian pitcher plant enjoys an airy, sandy soil mix for its branching, woody rhizome. Root shoots will cause plant clumps that appear like mounds of hungry traps. 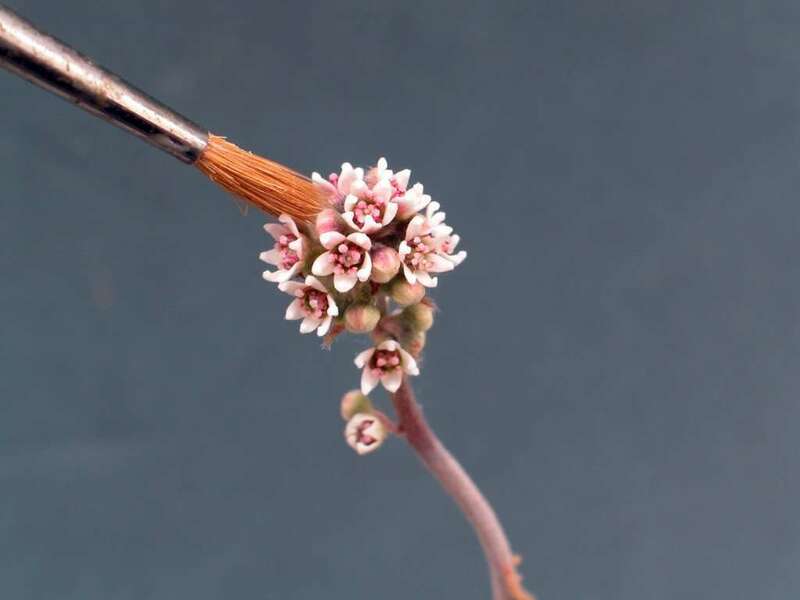 During late winter, 2″ root cuttings can be taken for propagation purposes. 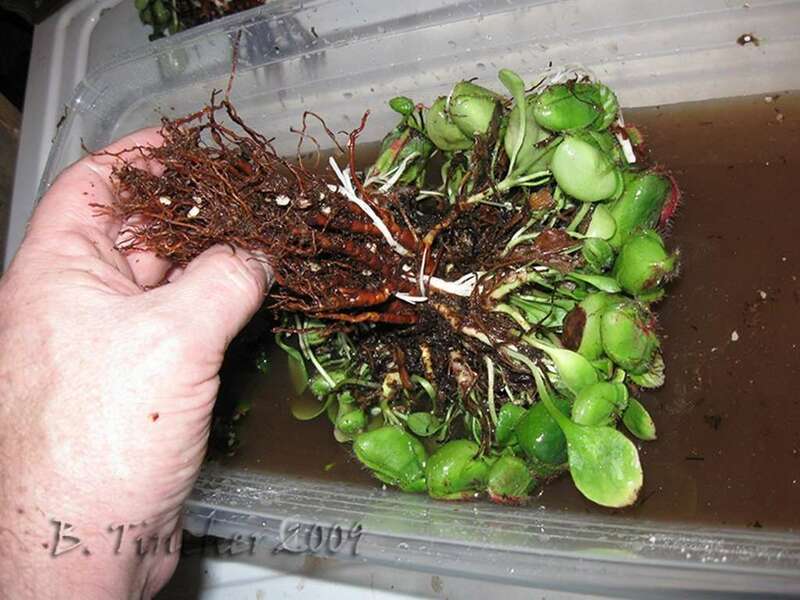 See below for root-cutting and propagation techniques. Australian pitcher plants produce long, 2-foot flowering stalks during the summer. Due to the length and weight of these flower stalks, they sometimes lean against the ground. Towards the end of the stalk you’ll find clusters of small green flowers that lack petals. A few of these flowers will open at any given time, and should be teased with a paintbrush daily to transfer pollen from one flower to another. 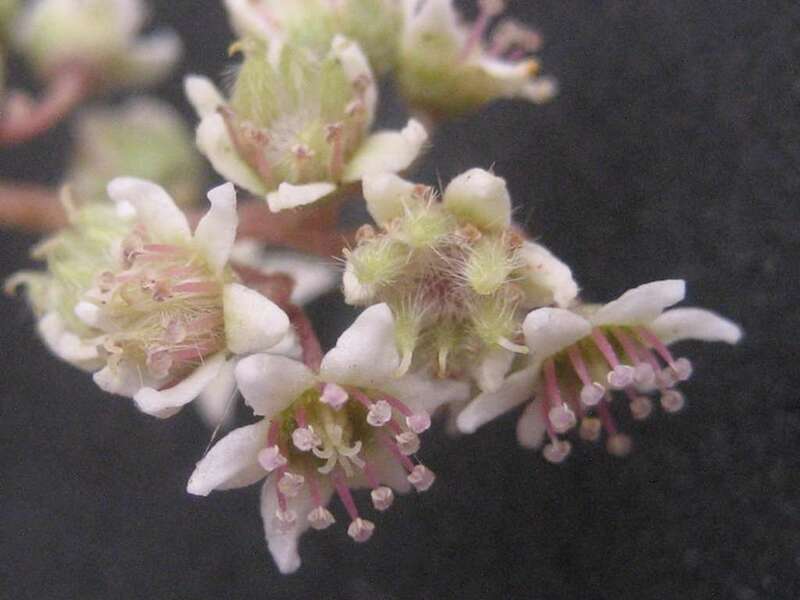 After several weeks, you’ll notice hairy beige seeds within the successfully pollinated flowers. 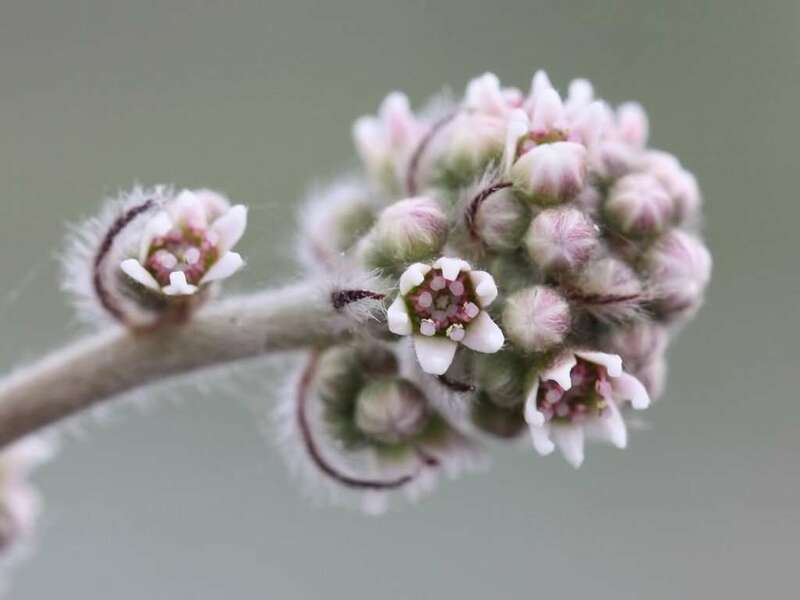 Each flower should produce between six to ten seeds – one per ovary. Seed viability is short, so our recommendation is to sow immediately. Stored in a refrigerator, they will survive no longer than about four months. 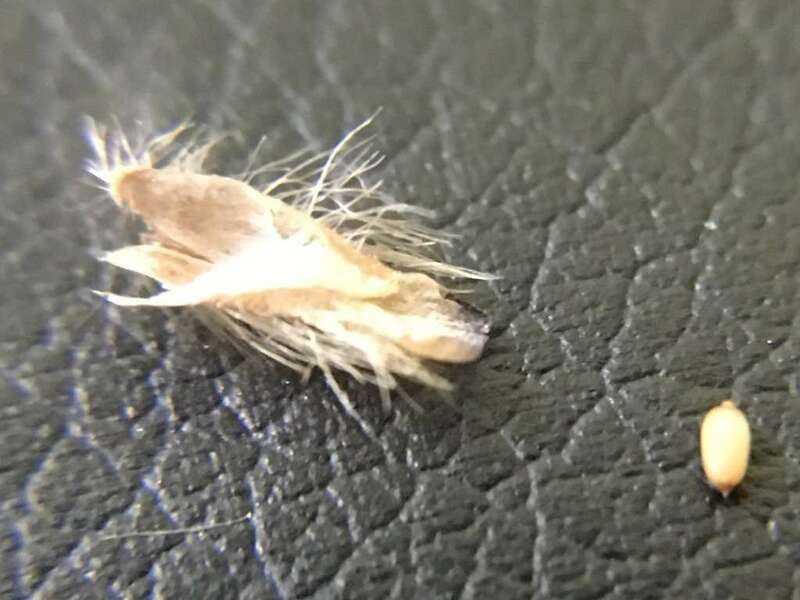 Read below for seed germination tips. 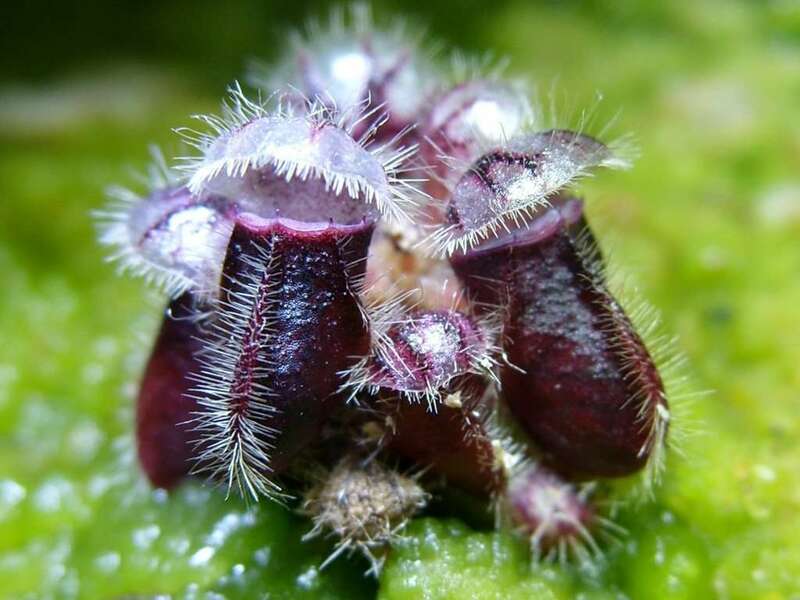 First described in 1806 by the naturalist La Billardière, Cephalotus follicularis is a monotypic genus with the Latin name describing both the structure of the leaf and the flower. Cephalotus originates from the Greek “kephalotos” meaning “headed,” in reference to the flower’s stamen structure. Folliculus means “a little sack or bag” in Latin, describing the shape of the traps. There is a 250 mile range along the coast of southwestern Australia where Cephalotus follicularis naturally thrives. It is near Esperence Bay between Augusta and Cape Riche where where you can find the Australian pitcher plants hanging out in the shade of neighboring plants. It is a threatened species, so make sure to get yours from reputable greenhouse growers. Plant Australian pitcher plants in one part washed silica sand, to one part perlite, to one part peat. Always use deep, drained containers to avoid root rot. Plastic, glazed clay, and terra-cotta pots work well. Use distilled or reverse osmosis water. This can be inexpensively purchased in most grocery stores, or you can invest in a reverse osmosis (RO) filtration system that hooks up to a sink (bonus – this also provides great drinking water for humans and pets). Keep the plant in a water tray and let the tray dry out in-between waterings – Cephalotus are unhappy in waterlogged conditions. Australian pitcher plants will get more colorful pitchers in bright sun, but also enjoy partial shade. They’ll happily nom on any bug that reasonably fits in a trap – flies, spiders, small crickets, or wingless fruit flies. If feeding live insects isn’t your thing, you can use dried insects that can be found at pet food stores (lizard food). Remember, these plants grow naturally in nutrient poor soils – a major reason why they evolved traps to catch insects as their source of nutrients. Fertilizing can damage the plant if not done with care. Advanced growers can drop slow release nitrogen tablets into traps, or use a diluted orchid fertilizer (1/4 to 1/2 teaspoon per gallon) to foliar-feed plants (applying it to the leaves of the plant or into the pitchers). As with other insectivores, avoid fertilizer coming in contact with the root system. Repotting in later winter or spring while the plants aren’t growing rapidly will minimize stress on the plant. Be very careful with the root system as they are brittle and can easily snap off the plant. This makes taking root cuttings easy, but it also leaves the plant open for unnecessary damage. Separating several Australian pitcher plant crowns into individual potted plants will encourage new growth. Make sure each crown has a few healthy roots to support new growth, and cut the rhizome to divide plants. This is a great opportunity to also attempt root and leaf cuttings. Pot the individual plants into their preferred soil, keep humid and bright as they recover. Who wants to wait for seeds to grow?! Supercharge your Ceph collection by taking leaf cuttings that will develop into mature plants in two or three years. Grasp a pitcher or leaf at the petiole and tug it away from the rhizome with the goal of keeping as much of the whitish leaf base attached to the leaf as possible. Lay the cuttings right-side up on their preferred soil mixture. You can introduce some long-fibered sphagnum moss to improve moisture retention. Place a small amount of soil over the end that was separated from the parent plant to pin the cutting down. Cover with a humidity dome or place in a plastic bag to maintain high humidity. Keep cool-to-warm and maintain bright light. After several weeks, plantlets will appear at the cut end of the petiole followed by a small root system a few months later. Root cuttings will produce mature plants even faster than leaf cuttings! Attempt this while transplanting a parent in late winter. 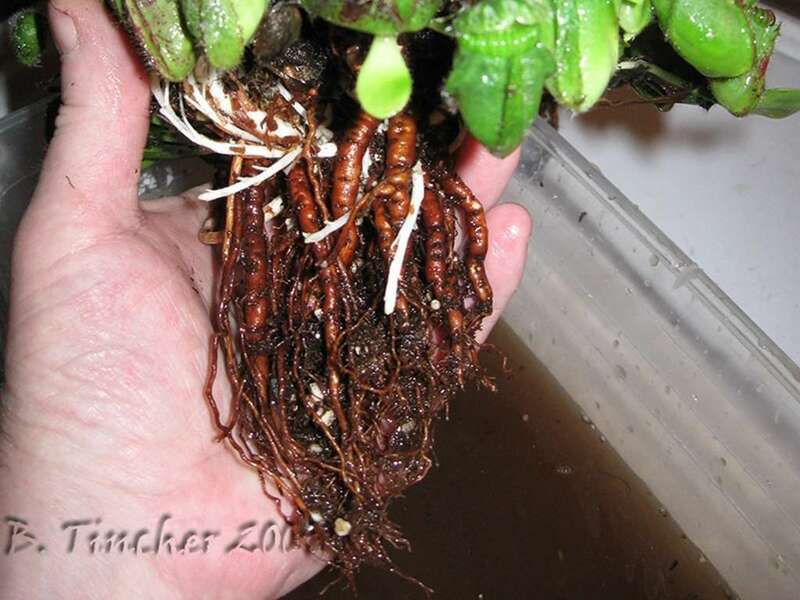 Start by rinsing soil off of the root system exposing the rhizome. Cut off 2 inch chunks of rhizome that are supported by additional roots, leaving plenty behind for the parent plant. Pot these rhizome cuttings in preferred soil mix with roots facing down, and by covering with about 1/2 inch of soil. Keep humid and in bright light and you’ll notice shoots poking up through the surface in several weeks. 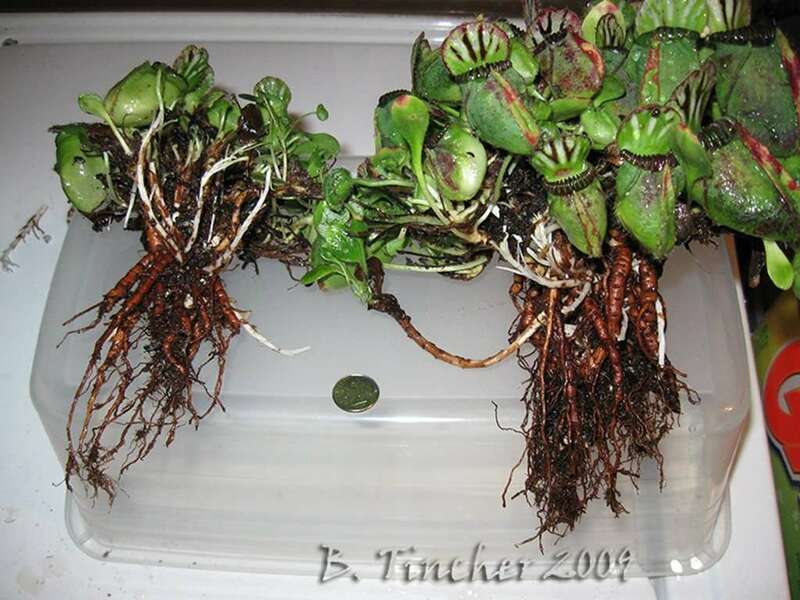 We recommend sowing Cephalotus seed immediately after production due to their short viability period. Sow into the preferred soil mix or straight long-fibered sphagnum moss. Stratification of the seeds is a little controversial, with mixed germination success rates in stratified versus unstratified seed. We recommend experimenting!To stratify seeds, keep them damp and cold for two months. After this period, place them in warmer temperature and increased light – those that they will be growing in – and you should see sprouts after several weeks. Germination can continue for several months.Expect the plants to be about an inch in diameter after one year. In vitro propagation works with Cephalotus seeds, but plantlets need a well-developed root system prior to transplantation into soil. Tissue culture plants may initially grow slower than normal seedlings. Scale is the primary pest of Australian pitcher plants and can be treated with Diazinon, Orthene, or Malathion. If fungi is attacking your plants, it’s indicative of too high humidity levels and insufficient lighting. Treat with a fungicide and adjust the growing conditions. With Mediterranean-esque preferences, keep Australian pitcher plants warm during the summer and cool-to-chilly during winters. Avoid extreme or extended heat. Cool summer nights are great, and make the plants suitable for many coastal regions. The plants will survive a light frost into the mid-twenties, but avoid if possible. If you can match Mediterranean-like climate conditions, they make great candidates for sunny decks and porches. Cool summer nights are a plus. Cephalotus follicularis does well in warm and cool greenhouses. Cephs do great in unheated greenhouse-style terrariums and exhibit bright coloration under grow lights. If kept humid, Australian pitcher plants can grow well in partly sunny windowsills. Consider the Mediterranean growing conditions. If you can meet these requirements, Australian pitcher plants will do great in deep bogs that don’t get waterlogged. Are we missing a species, hybrid, subspecies, or plant variety? Help us improve our carnivorous plant database by submitting your own! 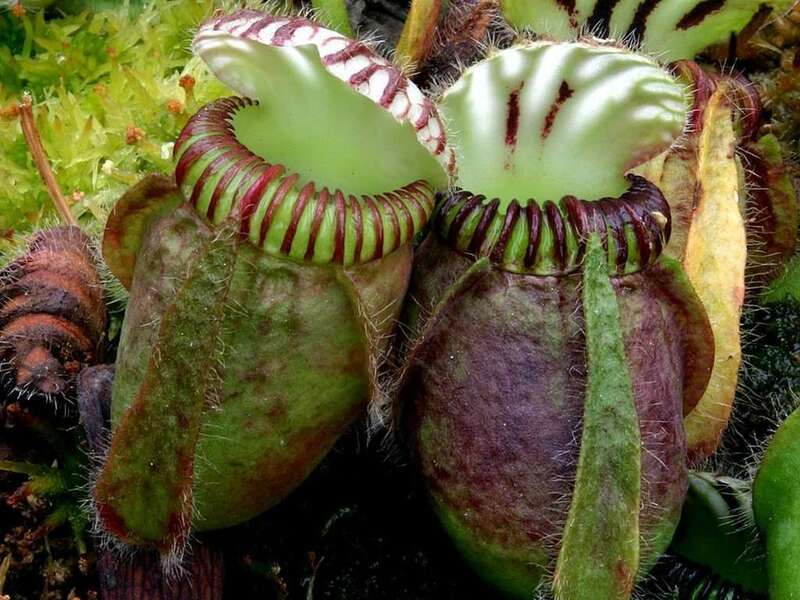 Subscribe below to stay up to date on everything carnivorous plants!